Marvel Comics’ God of Thunder gets the big screen treatment courtesy of director Kenneth Branagh, three screenwriters, two story writers, and three comic book creators. Branagh assumed the difficult task of creating a race of gods that could (to at least some degree) seem as real as their human counterparts while readying the titular hero for both a franchise and a collaborative role in next year’s highly anticipated Avengers. He pulls it off to some degree thanks to a fast-paced story, some classy actors, and enough comic book references to keep the fanboys enthralled. Thor comes from the mythical realm of Asgard, which is indeed a “realm” rather than a “planet” although both habitats are located in outer space. The natural enemies of the Asgardians are the Frost Giants who inhabit a neighboring realm and resemble the orcs of the Lord of the Rings films with the addition of icicles for hands. Viewers meet Thor in his cocky youth just as his ascendancy to the throne is interrupted by a Frost Giant attack. Thor and his noble friends, which include the likes of Punisher: War Zone‘s Ray Stevenson and Japanese film heavyweight Tadanobu Asano, retaliate with a hastiness that leads to the Thunder God’s banishment from Asgard by order of his father Odin (Anthony Hopkins). 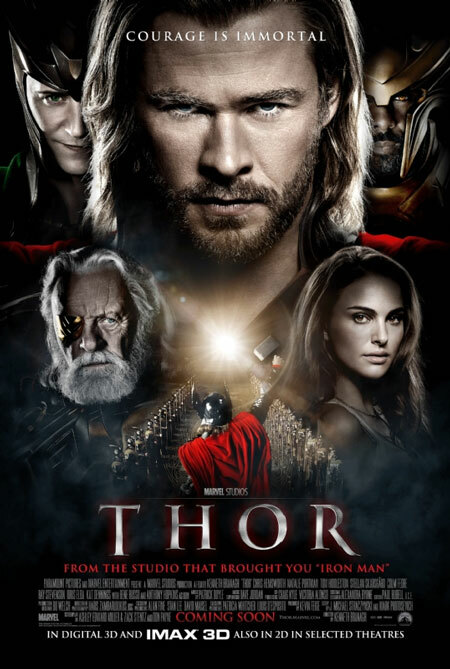 Thor is sentenced to a powerless life in New Mexico, Midgard (aka Earth) where he meets some friendly scientists (Natalie Portman, Stellan Skarsgard) and is forced to grow up quickly in order to foil the plans of his mischievous half-brother Loki (Tom Hiddleston). Along the way there are plenty of references to comic book lore, a cameo by future Avenger Hawkeye played by The Hurt Locker‘s Jeremy Renner, and the obligatory post-credits appearance by Samuel L. Jackson as mysterious spymaster Nick Fury. Fun stuff. The film’s visuals alternate between planetarium-like and paintings-on-the-sides-of-vans-in-the-70’s-like, except during the scenes on Earth, which are dusty and barren. The costumes are impressive and the classy cast that sport them deliver their lines with utmost sincerity. There are, predictably, some awkward moments including some fish-out-of-water humor and a romance that feels rushed and unconvincing, but that’s to be expected from a story as ambitious as this one. If you’re into superheroes then you’ll find the film’s flaws to be easily forgivable. Thor opens wide in Philadelphia-area theaters today.